The Psychology of Stalking is the first scholarly book on stalking ever published. Virtually every serious writer and researcher in this area of criminal psychopathology has contributed a chapter. 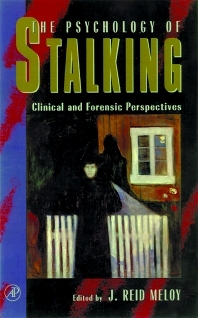 These chapters explore stalking from social, psychiatric, psychological and behavioral perspectives. New thinking and data are presented on threats, pursuit characteristics, psychiatric diagnoses, offender-victim typologies, cyberstalking, false victimization syndrome, erotomania, stalking and domestic violence, the stalking of public figures, and many other aspects of stalking, as well as legal issues. This landmark text is of interest to both professionals and other thoughtful individuals who recognize the serious nature of this ominous social behavior. J.R. Meloy, The Psychology of Stalking. R. Saunders, The Legal Perspective on Stalking. K.K. Kienlen, Developmental and Social Antecedents of Stalking. M. Zona, R.E. Palarea, and J.C. Lane, Jr., Psychiatric Diagnosis and the Victim---Offender Typology of Stalking. G. Skoler, The Archetypes and Psychodynamics of Stalking. D.M. Hall, The Victims of Stalking. L.E. Walker and J.R. Meloy, Stalking and Domestic Violence. J.R. Lion and J.A. Herschler, The Stalking of Clinicians by their Patients. R.A. Fein and B. Vossekuil, Preventing Attacks on Public Officials and Public Figures: A Secret Service Perspective. R. Lloyd-Goldstein, De Clérambault On--Line: A Survey of Erotomania and Stalking from the Old World to the World Wide Web. J. Meyers, Cultural Factors in Erotomania and Obsessional Following. K. Mohandie, C. Hatcher, and D. Raymond, False Victimization Syndromes in Stalking. G.S. Lipson and M.J. Mills, Stalking, Erotomania, and the Tarasoff Cases. D. Westrup, Applying Functional Analysis to Stalking Behavior. S.G. White and J.S. Cawood, Threat Management of Stalking Cases. Index. Dr. Reid Meloy is a diplomate in forensic psychology of the American Board of Professional Psychology. He was Chief of the Forensic Mental Health Division for San Diego County, and now devotes his time to a private civil and criminal forensic practice, research, writing, and teaching. He is an associate clinical professor of psychiatry at the University of California, San Diego, School of Medicine, and an adjunct professor at the University of San Diego School of Law. He is also a Fellow of the Society for Personality Assessment, and is currently President of the American Academy of Forensic Psychology. In 1992 he received the Distinguished Contribution to Psychology as a Profession Award from the California Psychological Association.Dr. Meloy has authored or co-authored over 100 papers published in peer-reviewed psychiatric and psychological journals, and has written or edited four books. He is a sought after speaker and psychological consultant on various civil and criminal cases throughout the United States, most recently the Madonna stalking case and the Polly Klaas murder case. In 1997, he completed work as the forensic psychologist for the prosecution in United States vs. Timothy McVeigh and the United States vs. Terry Nichols. Private Practice, San Diego, California, U.S.A.
"The Psychology of Stalking: Clinical and Forensic Perspectives is a comprehensive, up-to-date scholarly review that included everything from Shakespeare's stalking sonnets to cyberstalking. It provides a wealth of useful information. The book is must reading for law enforcement and mental health professionals who deal with stalkers." --PHILLIP J. RESNICK, M.D.